The Maplewood & Lucy Flower Park Advisory Council (MLFPAC) acts as West Bucktown's volunteer liaison between the community and the Chicago Park District. Those two beautiful parks we all enjoy within West Bucktown's boundaries? They are the result of hundreds of hours of sweat equity and grant writing by MLFPAC and Garden Club volunteers. (You didn't think all those new bulbs, flowers, and trees planted themselves, did you?) During the spring and summer months, you'll find Chicago Park District employees, MLFPAC members and other community volunteers working to weed, water and maintain Maplewood and Lucy Flower Parks for all of us. It's a big job, but we do it because we firmly believe that strong parks make for strong communities. In addition to spearheading gardening, landscaping, and clean-up efforts, MLFPAC also acts as the "eyes and ears" for the Parks District. We report graffiti, submit maintenance requests, promote Park District programs at Maplewood, and keep a close eye on gang activity in the area. Members also attend semi-annual Park District budget hearings to lobby on behalf of Maplewood and Lucy Flower, and conduct fundraising and grant writing throughout the year to cover additional expenses, such as the Lucy Flower renovation project and scholarships for area children to attend Park District programs at Maplewood. 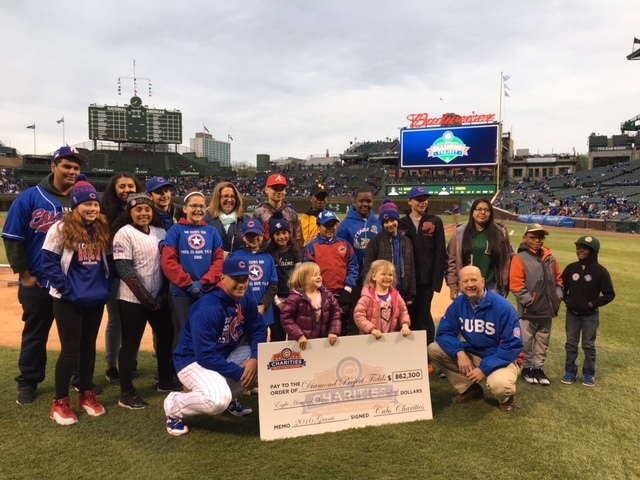 The MLFPAC is delighted to announce the award of $85,000.00 from Chicago Cubs Cares and LISC Chicago to fully renovate Maplewood Park's derelict ball field. Thanks to this grant award, we will once again have a field that functions and has utility, providing greater opportunities for recreation and learning to area youth and adults. The Chicago Park District will maintain the field after the construction ends; the project is slated to begin in fall of 2017. As noted by Park District signs, dogs are not allowed on the field or off leash.